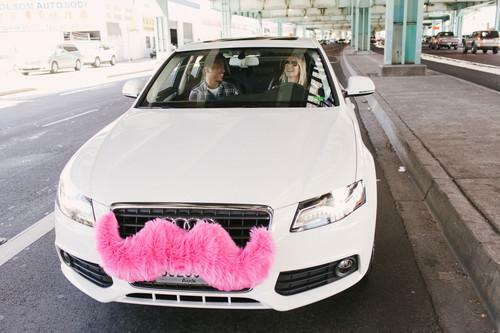 A Lyft car sporting its standard pink mustache. People using the transportation apps Lyft and Sidecar in California will no longer be able to skimp on their fares, now that both apps have ditched their donation model. Sidecar said Friday it was doing away with donations and instead introducing minimum fares. The changes apply only in California and take effect Friday on iOS and Android devices. Sidecar rival Lyft reportedly made a similar switch. It will begin requiring users in California to pay a minimum fare some time in the next few weeks, the Los Angeles Times said. Sidecar made the change to better support its drivers, CEO Sunil Paul said in a blog post. The company has seen a 50 percent increase in driver applications since September, he said, but it has also learned from drivers that they would drive more frequently and provide longer rides if they could depend on a fair payment, Paul said. Previously, Sidecar suggested a donation amount at the end of the ride, but riders could still pay whatever they wanted. Now, when people book a ride they will be shown a minimum payment up front. If the ride was exceptional they can still pay a higher fare if they want to. The payment will be determined based on distance, time and traffic. Sidecar says it currently costs a little less than a regular taxi in San Francisco, and 20 percent to 40 percent less in San Diego and Los Angeles. Sidecar is also active in Seattle, Chicago and other locations, but the relationship between riders and drivers needs to be better if the service is to go mainstream, Paul said Thursday at a conference in San Francisco. Providing a better experience for drivers will be a goal for the company going forward, he said. Sidecar cleared a major legislative hurdle in California in September, when the state's Public Utilities Commission approved regulations on so-called "transportation network companies," essentially legitimizing services from companies like Sidecar and Lyft.